Aloe Vera has always been around us but its importance in food, health, and holistic well-being has only been revealed recently. Let’s find out the health benefits this Indian medicinal plant offers. It is abundant in vitamins such as vitamin A, C, E, B1, and B2. All these vitamins can help improve skin texture as well as aid in the quick repair of damaged skin cells. It is rich in iron, amino acids, magnesium, zinc, folic acid, and a few other minerals that help keep the body well-nourished. Freshly prepared Aloe Vera gel is great for under eye dark circles. 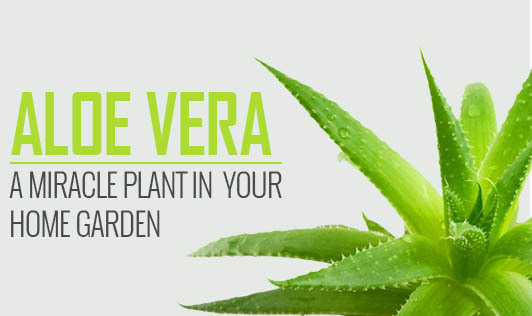 Aloe Vera can help you get flawless skin without squandering away thousands on beauty parlor visits. It is used widely in making skin care formulations such as skin-tightening creams or anti-ageing gels. It has proved its best use in fighting obesity as it hits cellulites quite effectively. People use it orally as a healthy laxative and this promotes weight loss significantly. Aloe Vera juice promotes digestive function and is quite helpful in treating acid reflux and heartburn. The sap of this medicinal plant can be uses in making hair packs for shiny hair. This miraculous plant grows quite easily in your home garden. Its cactus like appearance is simply adorable and it enhances the beauty quotient of your natural spaces.